When it comes to intelligent LEDs, American DJ remains on the LED-ing edge. 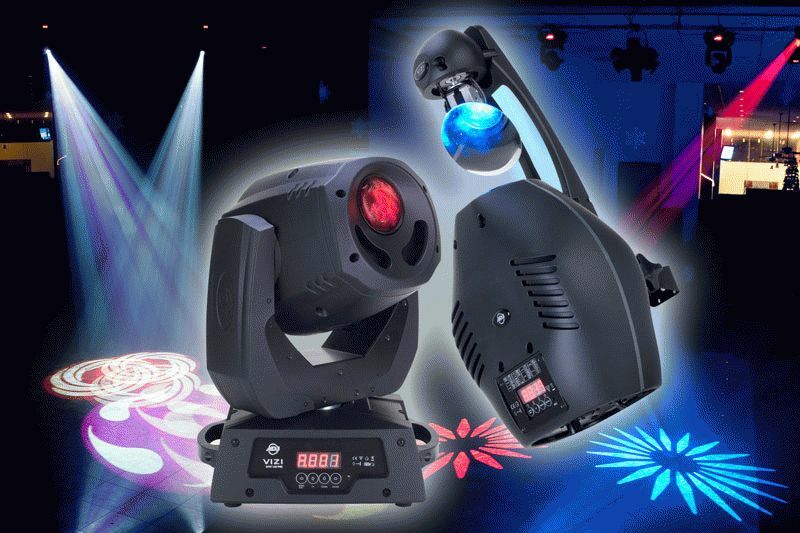 The company has introduced its two most advanced, powerful and feature-rich DMX-compatible LED fixtures to date: the Vizi Spot LED Pro and Vizi Scan LED Pro, a moving head and scanner respectively. Running on a gigantic high-output 50-watt LED source (6,500°K), the Vizi Spot LED Pro and Vizi Scan LED Pro are “2-in-1” hybrid effects that set new standards in performance, professional features and efficiency. Each of these fixtures can function as either a spot or wash effect, thanks to a variable Frost Filter that can be applied to transform the unit’s hard-edge spot beam into a diffuse wash of color, making these two of the most versatile entertainment lights around. Their powerful 50-watt LED casts incredibly brilliant beams on dance floors, stages, walls, and ceilings, yet each of these energy-efficient units consumes only 130 watts of electricity at maximum use. What’s more, their long life LED source is rated at 60,000 hours. And because LEDs produce very little heat, stage performers and club patrons will always remain cool and comfortable under the Vizi Spot LED Pro and Vizi Scan LED Pro’s ultra-bright rays. Cool-running they may be, but the Vizi Spot LED Pro and Vizi Scan LED Pro have all of today’s “hottest” professional features and effects. Each includes 8 dichroic colors + white, and 7 rotating interchangeable gobos (5 metal, 2 glass) on separate color and gobo wheels, allowing for a vast number of combinations. For still greater variety, or when customized designs or messages are called for, the gobos can be easily replaced, thanks to the units’ SLOCK™ Slide Lock gobo changing system, which makes removing and installing gobos faster and easier. A separate Prism Wheel with 3-facet and Infinite prisms adds even more exciting visual possibilities. Featuring a 13° beam angle, the Vizi Spot LED Pro and Vizi Scan LED Pro also include a Gobo Shake effect, Gobo Scroll mode, Strobe, Frost effect, 0-100% dimming, Remote Focus and Auto X-Y Repositioning. Flicker-free operation makes them ideal for stage and production applications. The difference between the two effects is that the Vizi Spot LED Pro is a moving head, while the Vizi Scan LED Pro is a scanner. The Vizi Spot LED Pro can pan 540° standard (630° optional), and tilt 270°. The Vizi Scan LED Pro pans 540° standard (630° optional) and tilts 35°. Both units utilize high-quality stepper motors with micro stepping for fast, accurate movements. Both the Vizi Spot LED Pro and Vizi Scan LED Pro can run in 4 operational modes: DMX, Master-Slave, Stand Along and Sound Active. When in DMX Mode, users can choose between 12- or 14-channel operation. A 4-button menu system on the rear of the unit provides easy, user-friendly access to DMX settings. Featuring multi-voltage operation (100-240V, 50Hz/60Hz), the Vizi Spot LED Pro and Vizi Scan LED Pro include 3-pin XLR In/Out and a hanging bracket. The Vizi Spot LED Pro measures 12”L x 10”W x 16.75”H/ 303 x 253 x 422 mm, and weighs 23 lbs./ 10.4 kg. The Vizi Scan LED Pro measures 11.75”L x 12”W x 22.25”H/ 297 x 301 x 563 mm, and weighs 17 lbs./ 7.5 kg. The MSRP of the Vizi Spot LED Pro is $1,799.95. The MSRP of the Vizi Scan LED Pro is $1,599.95.